It's always been a superb app, but with v5, Reason finally feels 'complete', offering a. highly satisfying musical environment. Rock-solid and CPU-friendly. Stunning new sequencing features. Kong drum device is awesome. On-board sampling. Streamlined interface. Surface-locking for control hardware. Single-column rack. Can't configure custom shortcut keys. Quick Edit mode in full effect! Here we get simultaneous control over level and pan for each and every pad in Kong. Reason's new sample editor is a streamlined joy to use - no frills, just thrills! The Synth Bass Drum module is designed for classic drum machine-style thumpings. Reason has been a firm favourite of ours since its original release a decade ago. Not just a virtual studio in concept, it offers a literal representation of a traditional MIDI studio, revolving around a simulated rack to which a huge range of devices can be added. Effects, synths, samplers, drum machines, mixers - all can be dropped into the rack and connected as you see fit by flipping around to the rear of the units and plugging virtual cables into their I/O ports. Sequencing is pretty much the only part of Reason that's not tied to the rack. "Ultimately, Reason's restricted nature is also its strength." Unlike almost all modern music applications, there's no third-party plug-in support - and there likely never will be, although you can connect Reason to other apps via the ReWire protocol. If there's one new feature that has our pulses pumping the most, it's the Kong Drum Designer. Each of its 16 pads can control any of 16 drum channels, each of which holds its own sound source module. The one you'll probably use most is NN-Nano, a stripped back version of the NN-XT sampler. The other modules are Nurse Rex (a mini Dr. Rex) and seven synthesisers. Each pad can be assigned to any drum channel and also bound to one of four 'hit types'. Sound modules respond to these; for example, Synth Hi-hat offers closed, open and two intermediate positions. NN-Nano's hit types, meanwhile, are four discrete multilayered setups. For Nurse Rex, hit types can fire off a loop, slice or slices. There are also pad-level Link and Alt group, level, pan, tone, decay and pitch controls, and two external sends and internal Bus FX send. Oh, and then there are the effects! Each pad has two slots, for one of nine effects or an additional tone or noise generator. Our favourite is the Overdrive/Resonator, but the Rattler comes a close second. We'd like to have the effects in the Reason rack too, but for now, you can route signals through Kong. There's also a send effect slot (eg, for reverb/delay) and a master slot for compression, etc. The small Q buttons positioned adjacent to most of Kong's parameters select them for Quick Edit mode, whereby all 16 pads display relevant controls. For example, hit the Q button next to the Pan/Level knobs and each pad turns into a mini X/Y pad for instant editing of pan and level. It's a fabulous system. There are a few omissions, though: when loading multiple layers, there's no automatic velocity mapping, and Kong lacks the seemingly obvious per-pad delay/offset function. But overall, it strikes the right balance between power and immediacy, and on the back panel, you'll find every connection you might need. In addition to its sample-based drum modules, Kong offers seven synthetic ones. Physical Tom Tom, Snare and Bass Drum mimic real instrument sounds using physical modelling, while Synth Bass Drum, Hi-hat, Tom Tom and Snare ape classic synthesised drums. It's a surprising inclusion given the huge number of sample banks on offer and the realism that multisampling affords. Surely you've already got all the drums you want with samples? Well, not quite. The ability to tailor each drum sound to the rest of your track is every bit as fun and useful as being able to edit synth patches. Of course, this requires a lot of tonal control - and Kong has plenty. Physical Bass Drum, for example, has no less than nine sound-shaping parameters, taking in things like beater density, tone and even shell level. You can get lost for hours designing drum kits and adjusting them in real-time. So how do they all sound - can they compete with samples? Well, the three physical modelling drums are rather impressive, offering a truly different and useful approach to real-sounding drums. With judicious tweaking of settings, they can be very convincing, particularly in conjunction with the two effects slots. As for the synth drums, these recall the unashamedly unrealistic tones of old school drum machines (as do the physical modelled drums, on extreme settings) and quickly prove their worth when let loose on a project. It's only a shame that you can't save individual drum module presets, although you can save entire banks. The other new device is Dr. Octo Rex. This backward-compatible replacement for Dr. Rex allows up to eight loops to be loaded at once. However, the variations you can now achieve with a single loop can make you forget you have eight to play with! Despite Reason's 'racks full of virtual gear' approach, previous versions couldn't sample audio directly like old school hardware samplers. That's all changed with Reason 5. Simply click a button on NN-Nano, ReDrum, NN-XT, NN-19 (we still love that Paul Hardcastle reference) or hit the icon in the Tool window to record your external source. "Blocks might sound simple, and, well, it is - that's the point." With the recording made, open the sample editor, which is at once both basic and beautiful. Start, end and loops points are set with the mouse, as are fades and normalisation. You can trim samples based around chosen start and end points, and snap these points to transients. Once you've recorded and edited your sample, you can save it for use in any suitable playback device in Reason - complete, rather usefully, with its loop setting (one-shot, forwards or forwards-backwards). One-click copying is another great feature, allowing quick variations to be saved. Like magic, Reason has gone from having no sampling functionality whatsoever to having perhaps the quickest tools of any DAW on the market. We challenge you to go from recording and editing a sample to playing it in a device in less time with anything else out there. Perhaps the best feature debuting in Reason 5 is Blocks. This is a way of defining blocks of arranged material, ie, clips and automation. They appear in the sequencer as a single track, and you can define and use up to 32 blocks. One might be an intro, another a chorus and so on. Blocks might sound simple, and, well, it is - that's the point. It's powerful, though, and could revolutionise the way you approach arranging. It makes reusing great edits easier than ever and lends a compositional spontaneity that - of all the major DAWs - only Live can match, while managing to be better for sequencing. Anybody who tries Blocks will miss it terribly whenever they use any other sequencer - it's that good. One thing we'd like to see, though, is the ability to highlight a section of arrangement and have Reason automatically create a block from it. You can do it manually, but there should be a more immediate function. Reason's Factory Soundbank has always been a useful resource, if not particularly extensive or inspirational. For v5, Propellerhead have called on a who's who of sound designers, including heavyweights like Adam Beyer (techno superstar), the Bomb Squad (legendary Public Enemy producers) and Printz Board (musical director of the Black Eyed Peas). There are drum banks, loops and more, totalling 1.5GB, with some genuinely great material to be found. Reason 5's newfound ability to lock controllers to specific devices shouldn't be overlooked. Elsewhere, there are more enhancements than we can list. The most obvious is a coming-of-age makeover. Reason and Record now share an almost identical aesthetic, with many control sections made slightly larger and more clearly delineated. The transport bar is improved, with larger level meters and a Tap Tempo button, for example. Record's virtual keyboard (use mouse or QWERTY keys) and Big Meter are also here. All of which leads to our one major complaint. Despite all the welcome homogenisation with Record, the latter's multiple rack facility is absent, so the single column of rack devices takes up only part of a widescreen display. This oversight is as infuriating as it is inexplicable. And there are a couple of other small gripes. For example, when we've talked about Reason in the past we've mentioned how we'd love to automate the Length control in the Groove section of the Toolbar. Playing with this in real-time yields an absolute goldmine of edits and breakdown effects, but it still can't be automated. However, you can now at least resample such live tweaks on the fly. On the topic of sample tinkering, the vast majority of DAWs now offer some degree of built-in loop slicing, so Reason users could feel maligned at having to fork out for ReCycle on top. 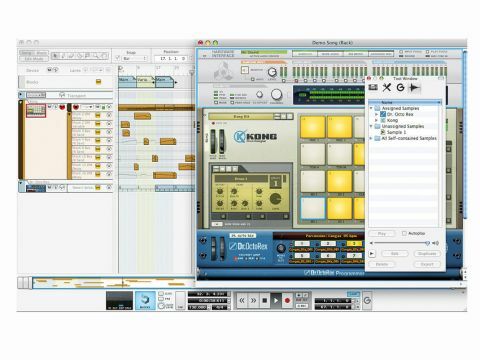 Some might argue that it's time to add basic audio track functionality, too, but when you look at how little extra it costs to get all of Record's amazing functionality, and factor in the built-in sampling that Reason now offers, we think Propellerhead have got the balance about right. One genuine grumble to round things off: we still think a comprehensive assignable key-command system is long overdue. Minor caveats aside, how does Reason stand up in 2010? Music software has progressed immensely since it first emerged, but Reason uses many of the same devices it's always had. Can it still compete? In short, yes. It's fair to say Reason has its own character, and while you can't use plug-ins, the built-in devices are great. The mighty Thor synth can produce everything from searing leads to bowl-breaking basses. All of your drum needs are more than met with Kong, ReDrum and NN-XT, and there's a comprehensive range of effects processors. Ultimately, Reason's restricted nature is also its strength. With only a few synths and a finite range of effects at your disposal, you really do get to know them inside out, in a way that very few producers bother to do now that there are so many plug-ins around. And by eschewing third-party plug-ins, Reason is made so rock-solid that come the nuclear apocalypse, only cockroaches, scorpions and Reason will be left standing. It can run on a very modest machine, too, being one of the most CPU-light music applications we've ever used. Most of us can benefit from using Reason as part of our setup, and as a number of name producers have shown, you can make complete tracks entirely in Reason. If you're into audio recording, it won't be for you, but perhaps its sibling, Record, will fit the bill. For almost anybody else, whether pro or hobbyist, it's a crime not to at least try Reason. Without a shadow of a doubt, this is the best version yet - but more than that, it really does make Reason a complete proposition at last.